Last month, my niece Ericka and her beautiful family came to visit from Florida. Truth be told, Ericka is like a daughter to me so having her home was a true blessing. I just can't believe how grown up she is and what an amazing mother she turned out to be. We are so proud of her. I wanted the tea to be fun, playful and a little fancy. As part of the activities I had planned to keep the the girls busy while they were here, was a bit of baking. We baked cupcakes, mini tarts and cheesecakes. 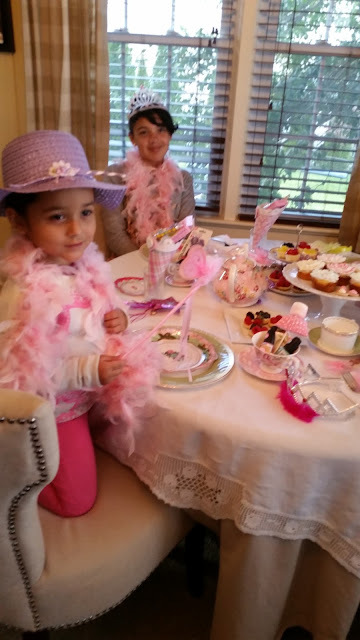 They also helped me decorate all the sweet treats for the tea party although they had no clue that all the treats they were helping me put together was for their surprise tea party. We had so much fun in the kitchen. I think both girls have more appreciation for baking after learning how simple ingredients turn into such pretty delights. Part of the plan included having my husband take the girls to the aquarium for a few hours to give me time to set everything up. That worked out perfectly. They had an amazing time at the aquarium and I had plenty of time to do my magic. And let me just say, what a priceless moment it was to see their reactions the moment they walked in and saw the table setup for tea. They had no idea. Such a success!!! Here is Ally's happy face. They were both so thankful. Here are Ally and Julie. All Julie could say for the first ten minutes was, "You tricked us".. Here they were playing dress up. 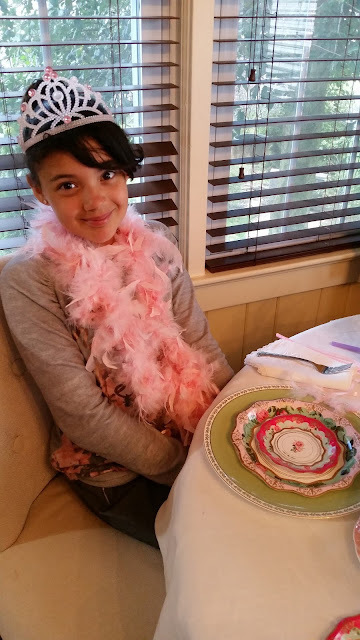 I did have dresses with tutu's for them to wear but they did not even think of changing into them with all the excitement going on the table. Such eye candy for them. They were slowly taking it all in. These are the cupcakes the girls help me decorate. Aren't these gorgeous? I think a tutorial is in order right? Let me know if you agree. Hats and feather boas' were a must for this party. I made these sweet paper funnels with scrapbook paper and filled them with candy, then I filled the teacups with nail polish is pastel colors. Paper plates in fanciful floral designs complete the table. A table full of giggles, laughter, fun and everlasting memories. Thank you for visiting. Wishing you a great weekend ahead. My dear sweet friend, what a darling tea party that you and these cute girls will remember for a long time. Oh Janet, everything is so precious! Your eye for detail really shines here. What a beautiful tea party, no wonder they were so happy and surprised. 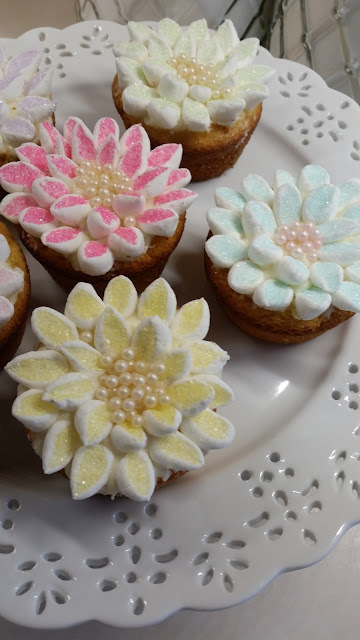 Yes, I would love to hear how you made those pretty cupcakes. 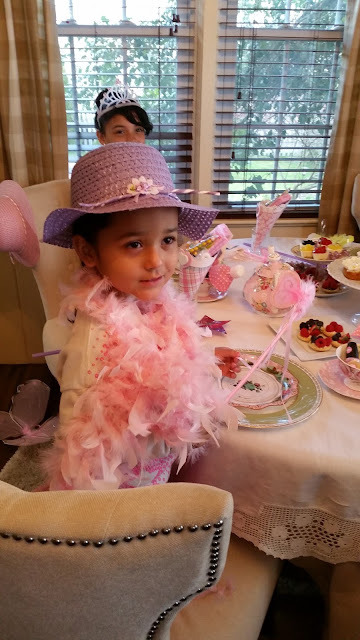 this wonderful tea party left me in awe and I'm sure you enjoyed so much living the gladness of your 'little ladies' that were the absolute protagonists of this precious event ! As usual your tables are unique, as for dishes and for refined details, thank you for sharing the gentleness of your heart, dearie ! A gorgeous table!! Beautiful young ladies all dressed up! Such gorgeous cupcake, I love it!! The dishes are all beautiful and put everything together so harmoniously! Lovely post! What a sweet idea to celebrate their visit with you! Everything looks so pretty and fit for a princess...or two! What a special treat that I'm sure they'll remember for a long time! Oh and yes for the tutorial!! 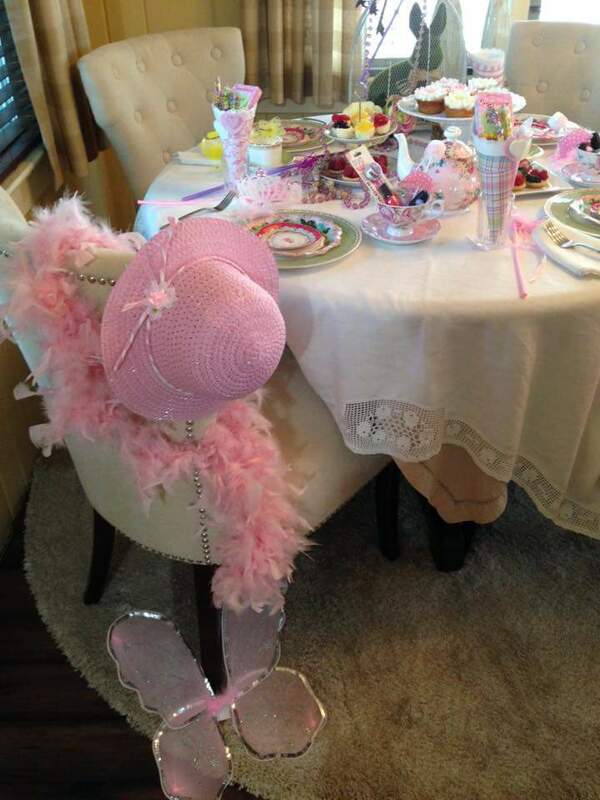 What a wonderful tablesetting for little girls tea party. Love the colors, love the cupcakes, love the whole idea of learing the little girls about having tea parties. Norwegians are coffeedrinking people, but how I would have loved for us to have this tradition. And yes - would LOVE a tutorial!! 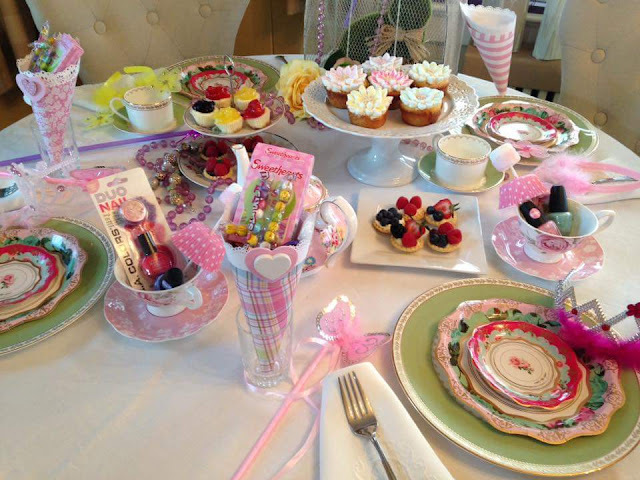 Oh Janet, what a wonderful, beautiful tea party. I am sure they were amazed when they saw your stunning table all set-up. Oh the lovely cupcakes and decorations. Yes, a tutorial please. 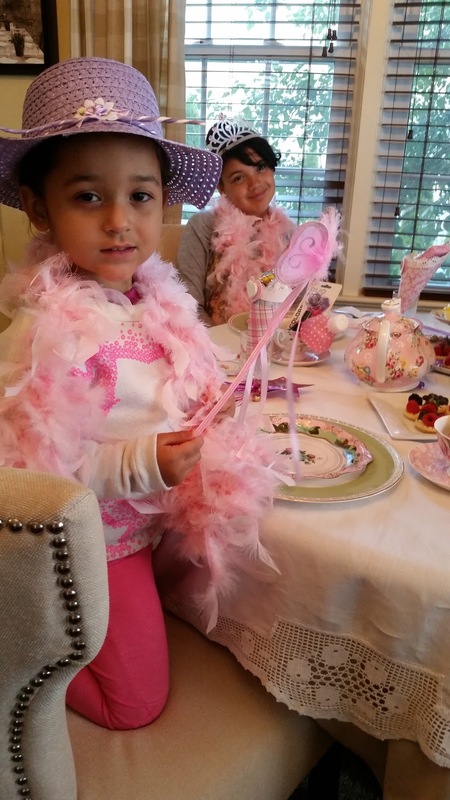 Thanks so much for sharing these beautiful young ladies with us and their great tea party. Ally and Julie look so sweet. What a lovely memory and special time. I know they loved it all. Thanks for sharing and linking. How fun! The girls must have felt like royalty. And all your pretty touches made it so special. Thank you for sharing it this week at Dishing It! & Digging It! 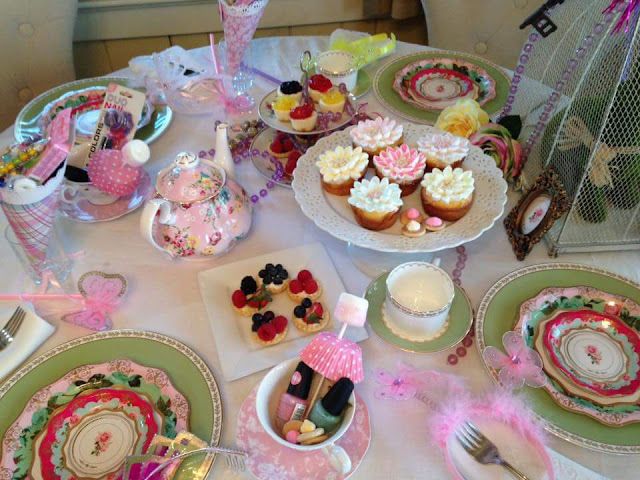 What a wonderful tea party you set up for the girls Janet. I love how pretty the table looks.